Bio StabiGel™ Orthotics are designed to fit all types of shoes and provide the benefits of support, control and cushioning. The product, which is "cobra shaped" in design, is made from a silicone solid-state elastomeric gel material, developed by Spracher Engineering Inc. This material offers high shock attenuation, a slow distortion rate and a very high resilience factor. It also protects against excessive pronation during midstance. Bio StabiGel™Orthotics can be used in athletic shoes by placing them under the existing insoles. They can also be used in men’s and women’s dress shoes and women's high heels by placing them directly on top of the foot bed. In addition, Bio-StabiGel™ Orthotics are well suited for all types of boots including hard shell (thermoplastic) boots such as ski boots and in line skates. In all cases, the product will not alter the fit, but will effectively alleviate foot pain and stress by stabilizing and cradling the heel while providing therapeutic arch support and redistributing pressure across the forefoot. HeelThotics™ Orthotics are designed to fit all types of shoes and provide the benefits of support, control and cushioning. 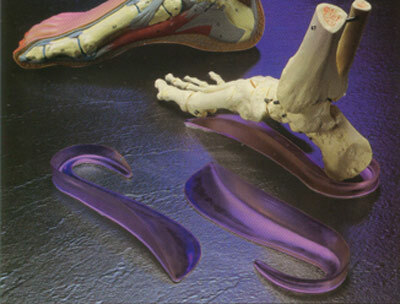 The product, which is "U-shaped" in design, is made from a silicone solid-state elastomeric gel material, developed by Spracher Engineering Inc.
HeelThotics™ Orthotics can be used in athletic shoes by placing them under the existing insoles. They can also be used in men’s and women’s dress shoes and women's high heels by placing them directly on top of the foot bed. In addition, Bio-StabiGel™ Orthotics are well suited for all types of boots including hard shell (thermoplastic) boots such as ski boots and in line skates.